The invisible life energy Qi (pronounced Chi) flows through everything making you feel vibrant and stay fit and healthy, mentally and physically. You feel invigorated every moment of life when your Qi is flowing freely. If, however, the energy becomes stagnant or blocked (through bad lifestyle or weakness of an organ) you are more likely to fall ill. Blocked or inhibited Qi causes dysfunction in the organ and endocrine systems of the body. Therapeutic treatments using the NeoQi Energy Cocoon can help you to replenish and free the circulation of Qi. Each session produces sensations and feelings of well-being, relaxation and calmness. Mental fitness is improved through the reduction of stress. 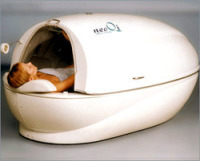 The NeoQi cocoon provides a unique sensation, which you can experience in a safe, private, comfortable and calming environment. Steam - Ensures an effective detox (excretion of waste products, toxicants and ballast substances from the body), increases biochemical processes in tissues, removes impurities and at the same time promotes skin texture, elasticity and tone, increases receptiveness to remineralizing therapies and the effects of active products. Infrared - More efficient and deeper heating of tissues (subcutaneous fat, muscles, joints, tendons), which causes reduction in volume of the body, treatment of arthrosis/ arthritis/myositis and sprains; trains the cardiovascular system, increases overall body tone, accelerates regeneration and rejuvenation, strengthens immunity system. 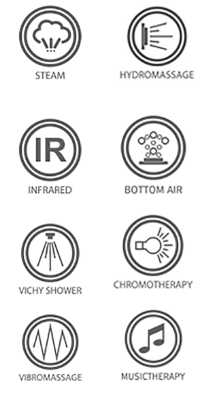 Vichy shower - Produces spray-like heavy rain, providing massage to parts of the body outside of the aquatic environment. The drops of water falling on your body, make you alert at first and relax afterwards. Vibrating bed - Accelerates tissue repair, helps eliminate toxins, has a positive effect on the neuromuscular system, improves muscle performance and the redox processes in their tissue, helps relieve stress, tension, pain, elimination of stagnation. Water (hydro) massage - Provides immediate relaxing effect due to the action of warm water streams with different pressure; increases blood and lymphatic circulation, stimulates metabolic and biochemical processes in organs and tissues. Therapeutic benefit comes from the relaxing effect of warm water, applied at variable force on the muscles. Air bubble massage - Ideal for reduction of the increased release of stress hormones, creating an element of psychological and physical comfort; reduces the severity of unpleasant and painful feelings of a different nature, relieves stress on the bones and joints, relieves insomnia. LED light - Represents the active energy of light, which has an enormous impact on our mind and soul – activates the physiological processes that regulate daily biorhythms, improves immunity, effective in the treatment of fatigue, depression, sleep disorders, neurosis and fatigue. Music therapy - One of the oldest and natural forms of correction of emotional states. Rhythmic components of music help to increase vitality, contributes to constant energy flow, relieve pain and nervous tension. It is said, that rest with music is more efficient than without music.